Home » A fly rod buying guide. 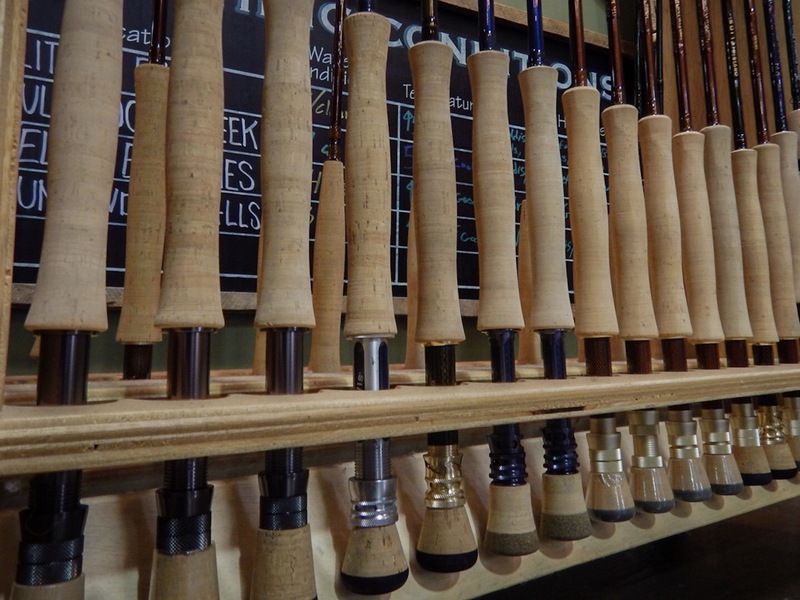 Our top 7 choices to finding your next favorite rod. Choosing a fly rod can be confusing to even the most experienced fly angler. We have more choices today than ever in the history of the sport. To complicate matters manufacturers pour thousands of dollars into marketing and promotions that can sometimes muddy the water more than clear it. But finding the right rod for you doesn’t have to be hard or confusing. After 16 years of fly fishing, and 5 years in the fly fishing retail business, I have found some tips to consider while searching for your next rod. There are some common pit-falls that we all encounter throughout our fly fishing journey and I hope this guide can help you avoid some. # 7) Price – It’s a range to work with, explore everything inside your budget. Price is of the least concern to me. Not because I have tons of money but because, practically, this should be one of the last factors in choosing your next favorite fly rod. You SHOULD have a budget for your purchase but don’t over-look rods that have a cheaper price tag than your max price. When I take folks out to demo rods I cut the price tags off because I don’t want them to be concerned with the price. I often find that people of all skill levels are surprised by the capabilities and feel of mid and entry level rods. Don’t get me wrong, top-end fly rods are great, but many mid-and entry level rods feel great too. My favorite example of this was my old $795 10ft 4wt Helios2 compared to my $425 10ft 3wt Recon. For my purposes of primarily high-stick/euro/contact/competition nymphing the Recon was a far more superior rod and half the price. Don’t let price fool you, pay attention to how the rod works for you and your purposes. If there is one thing I hate the most it is obsessive and blinding “brand loyalty,” however, I totally understand it. The problem with extreme brand loyalty, you are literally missing out on 90% of everything else that is out there. Sure, each rod manufacturer has their own tendencies. You may find that one rod manufacturer makes several rods that feel “right” to you and that is great. But when rod shopping be sure to try as many different rods as you can possibly get your hands on. You might think you are wasting the salesperson’s time but believe me, they would rather be outside casting with you than inside organizing the fly bins or folding clothes. I started out in the fly fishing world with an 8’6″ 5wt Eagle Claw Granger and Pfluger Medalist. But, man, did I ever want a Sage Z-axis with an Abel Super 5. As I fell further in love with the sport I bought a Redington Red Fly and an Orvis BBS III (Still have the BBS). One day I snapped the Redington while foolishly trying to unhook a scud fly from a rock. Not smart breaking a $100 rod for a $2 fly. It was my only rod and I thought I was done fishing for months but after an email to Redington customer service I had a new rod in my hands before the week was out. I think they sent the replacement before they even received the broken rod. The point is, I completely understand brand loyalty when it comes to exceptional customer service, that should be part of your consideration. However, blind brand loyalty might cause you to miss out on your next new favorite fly rod if you are not looking. # 5) Warranty – You break it, you bought it. No worries. Ok, now we are getting into the important stuff. Whether a rod comes with a warranty IS something you want to consider. There are only two guarantees in fly fishing: #1) Eventually, all waders leak, always. And #2) In the war between fly rods and cars, fly rods lose, every time. Whether it’s a tailgate, power window, rear door, or if it’s falling off the roof, leaning against the back or side of the vehicle the fly rod loses. And those are just the few ways I have broken rods, I won’t even bring up what happened to several of the loaner rods I borrowed from our work loaner program for salmon fishing in Michigan, sheesh! Finding the right fly rod is a process and once you find the right stick for you it becomes an extension of your arm. I find that a synergy forms between myself and my best rods where casting becomes less mechanical and almost purely mental. I envision where I want the fly to go and it happens almost magically. Being able to affordably replace a rod like that is invaluable. The best part of a warranty is the peace of mind that you have with it. # 4) Length – it’s all about the angles. To me, length is all about tactics. So I first ask, how much reach do I need? Do I need to cast over tall grass? Do I need to keep my cast under any over-hanging cover? Am I fishing from a boat or wading? Do I need to make long mends? So on and so forth. A few of the benefits of a long rod are found in their ability to make longer mends, cast over tall objects, and generally improve drifts. Long rods help keep your line higher when you wade deep on big water. They also can be excellent for reaching out over water on tight cover creeks. Short rods also have many benefits. Typically I find shorter rods to be more responsive and therefore more accurate. For that reason, short rods have become the choice of many dry-fly devotees. Short rods perform well in tight areas and cover. I also find short rods to roll cast with ease on tight creeks. I consider rods 8ft and under to be short and rods 9ft and above to be long. The range between 8ft and 9ft is kind of a middle ground. These rods often do a bit of everything and at times are designed to be highly specialized. Rod length is greatly determined by your tactic/approach and the environment/conditions you will encounter most often. Line weight is mostly determined by the flies you will use. Sure, a heavier line weight rod will give you more backbone to fight a bigger fish but keep in mind that Lee Wulff was famous for hooking and landing 20lb+ Atlantic Salmon on a 6ft 5wt bamboo rod. Lee often fished this way because presumably it was what what he preferred, it is certainly sporting! His 5wt rod was more than capable of casting the flies that he used. Scientific Anglers has a great chart to help you build a balanced outfit for your intended purpose. Another consideration is wind and size fish. Here in Pennsylvania, wind comes into consideration when you talk about fishing on the big rivers such as the Susquehanna, Juanita, Allegheny, or Delaware. Using a heavier rod in windy conditions can be very helpful to punch through. However, you must consider how often you will encounter these situations. Purchase according to the most common situation you will face and not the exception. As for big fish, it certainly helps to have a heavier rod when specifically targeting big fish, but again, that rod is more of a specialty purchase. #2) Material – are we living in a material world or a world of materials? Welcome to the world of choices! It’s an exciting time in fly fishing. As materials, technology, and processes improve we now have more choices in what our rods are made out of. Let’s lok at the benefits of the major materials. Split-cane bamboo – the classic. A durable and hearty material, bamboo represents the first material of modern fly fishing. Rod makers have been working with split-cane for over a century. Modern cane rods are just as serviceable as their modern counterparts. Cane rods typically bend deeper and respond to casting with a slower feel relative to other materials. Although, this can vary greatly depending on the taper used. This responsiveness is both the charm and curse of bamboo. For many folks you either hate it or you fall deeply in love with it. Bamboo is not delicate, fragile, or weak. In the hands of a master caster I have seen a bamboo rod cast a line 114ft in competition. Not bad for a 6ft 11in 6wt rod. Fiberglass – a comeback. Glass rods have found a resurgence and it’s a good thing. Glass is typically slower than graphite but this makes it a ton of fun to cast. In fact, I find people who learn in glass excel when they pick up graphite. Glass rods load deep and let you feel the line and energy of the cast. Glass rods will also “telegraph” tracking issues right to your hand. If you get off track with glass, you will feel it in the rod and see it in the line. Glass is being used for a wide range of fishing and many major manufacturers have glass lines. My favorite reason for using glass in Pennsylvania is small stream fishing where I use a lot of roll casts and single hand spey casts. I prefer short and light rods (7ft 3wt) but manufacturers like Orvis and McFarland make a great selection of larger and heavier rods. Graphite – the modern work horse. It’s light, its strong, it’s powerful. Graphite fly rods are the standard and technology has pushed them to the max. Graphite is powerful and generates a lot more potential energy under load compared to the other materials. This means that given the same length and suggested line weight a graphite rod is capable of generating more energy. In theory, this makes graphite preferable but with power often comes stiffness that can cause a loss of tactile feedback. In other words, to gain more power some manufacturers have made their rods so rigid that they lack the feel and life that many casters prefer to aid their accuracy. Power = distance. Feel = accuracy and presentation. In Pennsylvania, accuracy is king. That brings us to the #1 factor. The number one, most important factor in the purchase of a fly rod is how it feels to cast. THAT DOES NOT MEAN HOW WELL IT WIGGLES INSIDE THE FLY SHOP!!! While wiggling a rod in a fly shop sounds borderline like a prosecutable offense it probably should be a federal felony because there is probably no worse way to judge a fly rod. If you think you can accurately judge the worth of a rod from wobbling it around you should probably save yourself the trouble and just go down to walmart and buy a broomstick and attach some fly line to that because you really won’t know the difference. The fly rod is part of the holy trinity of the cast. The other two essential elements are the line and your casting mechanics. Your mechanics will adjust according to how the line and rod interact. In other words, how the line loads the rod. That word “load” refers to the potential energy the line imparts on the rod when you move the rod tip. Every time you move a rod loaded with line the rod will bend in one way or another, that bend is creating stored “aka: potential” energy that will be released into the line when you stop moving. Wiggling a rod does not accurately inform you to how a rod will cast or fish, only casting will give you a good idea of how a rod will feel. Conclusion – this is a starting point. Now keep in mind this list is built around the common issues I find most folks who are new to the sport find themselves working through. Certainly, as you become more proficient, you develop preferences. Hopefully you will even find yourself needing specific features in your equipment where this list might not be categorically correct. My intent is to give you a starting point for your fly fishing journey, and maybe even save you a few bucks and some headaches. Remember, the best fly rod is the one in your hand when you are on the water. Where you go from there can be an exciting and life-changing adventure. Tight lines! Good piece. I’d love to see it followed by reviews. Rods under $300, for example, or favorite classic rods. That’s what I like to do..But I keep hearing and reading posts from people who just don’t have that “sixth sense” though. My suggestion is geared more toward the person who made the original post. When I started A fly rod buying guide really helped me get that feel. Once I had it I rarely use a shorter leader now, but for a beginner, it helps.